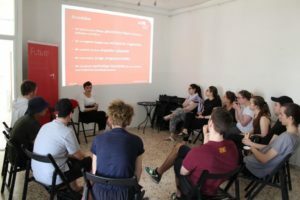 Although the youth movements in the International Falcon Movement – Socialist Educational International (IFM-SEI) broadly share their commitment to non-formal education, they each have different approaches and practices. In May, SJD-Die Falken hosted their 2018 Verbandswerkstatt, a conference for organisational development which brought together Falken branches from all over Germany. 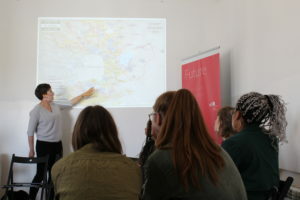 This year they invited Israeli and Palestinian activists from the Educational Cooperation in the Willy Brandt Center to exchange ideas about the theory and practice of socialist youth movements. Together with Falken representatives, the Israeli-Palestinian delegation read and discussed texts by Kurt Löwenstein, one of the founding fathers of the IFM-SEI and a thinker who has crucially shaped the Falken educational philosophy. The delegation also presented the history of their cooperation and gave insights to the successes and difficulties from the past 15 years. Another highlight of the delegation was a tour of Berlin with Eyas of “Refugee Voices”, who talked about parallels between German and Syrian history and shared his personal story and assessment of the challenges Syrian refugees face in Germany. The educational materials of the Bundeszentrale für Politische Bildung (Federal Agency for Civic Education) have been a staple in every German high school for decades. Almost every German student has them on their desk when they cram their exams in history or political science. It was thus a great honour to welcome some of the thinkers and writers behind these materials for a day of talks and exchanges in the Willy Brandt Center. 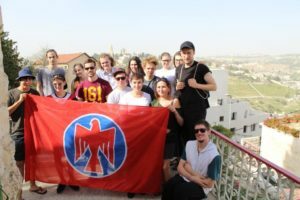 The delegation of the Bundeszentrale, including President Thomas Krüger, has been travelling all over Israel to mark the 70th anniversary of the country’s independence. During their visit to the Willy Brandt Center, they enjoyed the opportunity to discuss the prospects and challenges for a political solution to the conflict with Palestinian academics and activists from Jerusalem and the West Bank. Dr Omar Yousef, a distinguished architect and professor of Al Quds University, shared his perspective about the legacy of the Nakba and the discrimination against Palestinian residents of Jerusalem on an institutional and daily level. 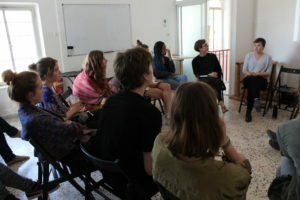 Riman Barakat and Abeer Natseh, two most impressive business women, talked about their experiences of working in Israeli-Palestinian economic cooperations and equally highlighted how their personal stories have shaped their political outlook on the conflict. In the final session of the day Maja Sojref, the project coordinator for Peace Education at the Willy Brandt Center, presented the work of the Center and gave insights about the efforts of Israeli and Palestinian youth movements building a joint educational program. We hope to welcome the Bundeszentrale für politische Bildung again soon and to continue exchanging how civic political education can help combat polarisation, racism and political apathy in Germany, Israel and Palestine. The Easter holidays are always a busy time for the Willy Brandt Center. 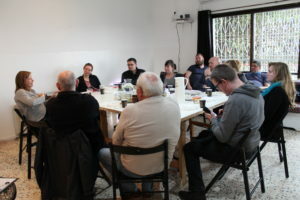 This year, Falken delegations from Baden Wurttemberg, Hessen and Berlin, as well as from the Archiv der Arbeiterjugend (Working Youth Archive), visited the center to learn more about the cooperation of the IFM-SEI (International Falcon Movement – Socialist Educational International) movements in the Middle East and their relations with SJD – Die Falken. Each delegation customized their program in Israel according to their exchange partner organization. 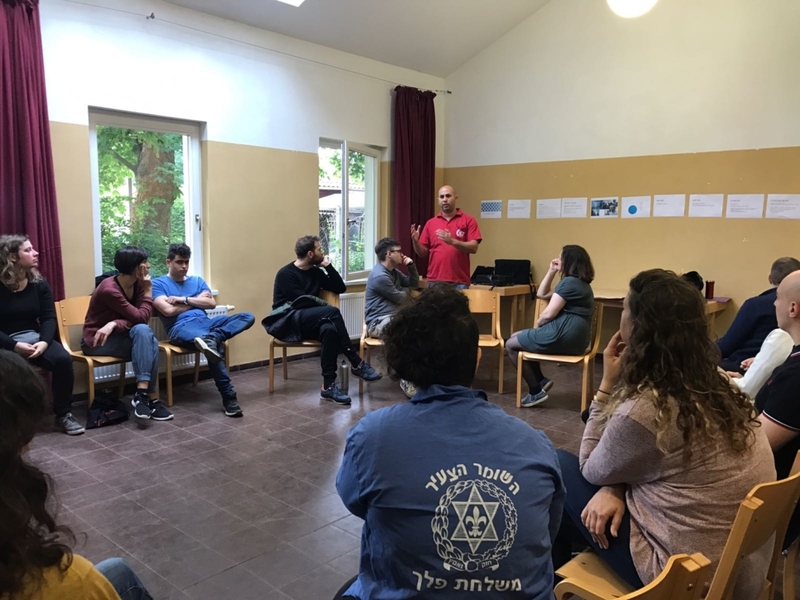 The Falken from Hessen and Berlin for instance travelled all over the country to meet with the Arab Section of HaNoar HaOved VeHaLomed (NOAL) and in the latter case took part in a workshop about anti-racism and cultural appropriation. 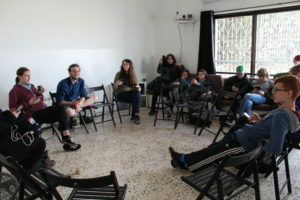 The group from Baden Wurttemberg organized an exchange in Rishon LeTzion in particular, to learn about the history and political practice of HaShomer HaTzair. On the other hand, the group from the Archiv der Arbeiterjugend visited archives, met with historians and collected sources relating to the Zionist Socialist movements. Their visit to the Willy Brandt Center was an additional opportunity for delegations to reflect on their time in Israel and to exchange thoughts about current political developments. Participants were particularly interested in the narratives and struggles of different ethnic, religious and political communities in the city and in the controversial decision to move the U.S. embassy to Jerusalem. So what better place to start talking about these questions than the balcony of the Willy Brandt Center, which offers one of the most stunning views of the Old City and East Jerusalem! Willy Brandt Center celebrates the 10th anniversary of the Educational Project! Ten years of this project means ten years of cooperation and partnership between four youth movements of the Middle East. The toughest standpoint in a conflict zone is to advocate for peace and dialogue. This exactly is the commitment of IFM SEI – Middle East Cooperation from its very first steps till today. The visit of the presidium of IFM-SEI gave opportunity not only to celebrate that anniversary but to elaborate the history of the cooperation: Its milestones and achievements as well as its hard times and difficulties and why we never think about giving up! As Willy Brandt Center Jerusalem, there’s nothing left to say but: Respect and thanks for the trust to let us be part of this unique process and shining example of peace education! We are looking forward to accompany your struggle for the coming ten years and still optimistic that it won’t be long until the Educational Project’s position will be standard.